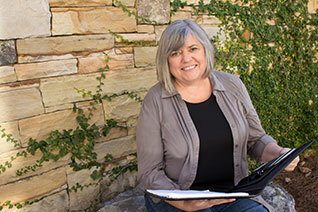 Joy Giusto has 18 years of landscape design experience. Her expertise includes residential designs, woodland gardens, container gardens, seasonal color, landscape design of small spaces and water features. Giusto earned a degree in landscape design from George Washington University and has worked for landscape companies in Virginia, Maryland and Georgia. She owned and operated a design/build company for five years and is familiar with all aspects of running a landscape company. In a project management role, she spends time at all the installations that she initiates. Joy holds a journalism degree from the University of Georgia and uses her publishing and advertising skills as she consults on marketing projects, in writing promotional copy and in promoting our work as she helps her clients obtain beautiful landscapes. Her three grown sons and their families, including a grandson and a new baby granddaughter live in Georgia. She loves hiking and plans to take up kayaking since moving close to Lake Lanier. A Bulldog fan, she follows University of Georgia athletics. Joy is interested in environmental issues and politics, and enjoys music and the arts.